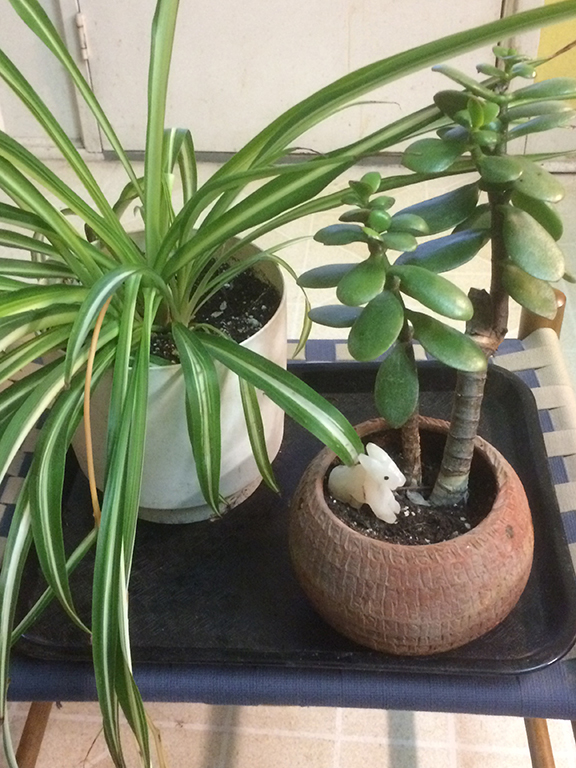 Two of the easiest indoor plants to grow are the spider plant and the jade plant, says Gardening Views columnist Mary Fran McQuade. BOOM! What just happened? Suddenly, houseplants are exploding out of the Internet and into shops and people’s homes. Just a little while ago, all the buzz was about native and pollinator plants. Gardeners were rushing to spread milkweed and asters all over the place. Some years before that, perennials were all the rage, with people vying to grow the best clematis, or hosta, or hydrangea. Now, we’ve turned our attention indoors. And that’s just fine with me. We have rotten gardening weather at least five months of the year, so why not bring our gardens indoors? The media claim it’s because Millennials don’t have the bucks for kids or houses, so they’re nurturing plants instead. Well, that’s a bit extreme. Most of us, I think, like to have some green things around to brighten up the place. People of all ages are squeezed by time and budget, and many don’t have an outdoor garden space. So why not take a break from the keyboard and give those leaves some lovin’? Indoor plant care calls for a bit more than water and sunshine, but not much. 1. Nothing nice grows in the dark. In nature, most houseplants grow in the filtered light of tropical forests, so they need good, indirect light. Put them near a window with very bright light all day or close below fluorescent lights. If you want flowers, you may need to brighten up the light source somewhat. Avoid direct sun, which can cook tender plants. 2. Water your plants when they need it. There’s no absolute rule for timing because different plants and different soils have different watering needs. Poke your finger in the earth about an inch and, if the earth is dry, add room temperature water until the excess starts to drain through the holes in the bottom of the pot. If – oh, horror – the container doesn’t have holes, you can try lifting it up. A well-watered plant is heavier than a dry one. 3. Unlike those hardy outdoor plants, most houseplants are comfortable living at the same temperature as we do. Exceptions are those pretty flowering plants we see in markets in spring, which like cooler springtime temperatures. (That’s because they’re not really houseplants at all, but outdoor plants from places with milder springs than ours.) Air circulation is good for indoor plants, but cold drafts are not. 4. Soil is one of the keys to growing good plants. You probably know plain garden soil doesn’t work. I don’t even recommend most of the stuff labelled potting soil. If it has a lot of peat in it, it dries out very fast, so it’s hard to keep properly damp without drowning the poor plant. If it’s mostly dark soil, it can clump and not let air and water flow through. Look for a blend that has mostly compost, with some peat and a fair bit of vermiculite or perlite added. (Those last two keep the soil nice and loose). 5. Like us, plants want food sometimes. They can do without during the short days of winter, when they’re resting. When they wake up and start growing, once a month is about right. An evenly balanced formula like 5-5-5 or 10-10-10 will build strong leaves, stems and roots. Use a liquid form, a powder dissolved in water or tiny, slow-release capsules mixed in the surface of the soil. There are also specialized fertilizers for plants like African violets and orchids. Anyone can grow these.And, if you’re a total newbie at indoor gardening, begin with these super easy ones: jade plant (Crassula ovata), snake plant (Sanseveria trifasciata), pothos, philodendron and spider plant (Chlorophytum comosum). They don’t need a lot of water or light, and they grow fast, so you’ll soon have cuttings to share.